Basically, I'm done with my robot now! In addition to that, today I worked on making the robot go up and down the ramp, which was quite successful. In addition to this, I did quite a lot of debugging which reinforced the robot's linetracing skills. Therefore, I think I am pretty ready for the Robocup Junior 2015 Kyoto Regional Competition which will be held next Sunday. However, it doesn't mean I won't do anything throughout the week. I will continue on with my debugging process. Another thing that I will have to do is to make a well outlined check sheet. This will be a reminder for me not to forget to reset something or check something before the competition. The last, and perhaps the most important thing would be setting my mind towards the competition. Since I am in an MYP school, I have to complete the personal project program in 10th grade(which is now). 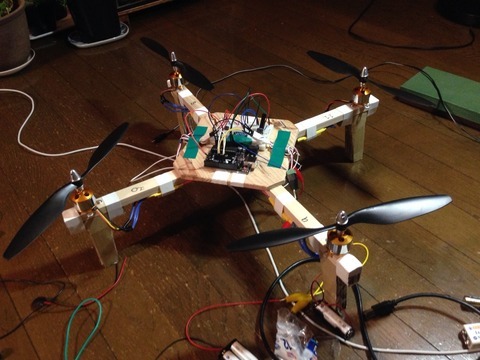 Since my hobby is robotics, I chose to work on creating a quad-copter. When I started this activity, I had no idea what so ever how to make one. This is beacuse I have only worked with lego for the past years. Well, the photo above is the thing. I will post the process journal when the project is completed.